In a small apartment, creating a space for projects can be tricky. 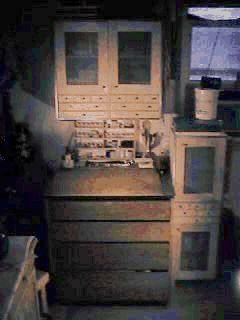 My workbench is actually an ex-bedroom dresser. The bottom 2 shelves of which were 'sawed off' to lower the work surface to a useable height. I have but one power tool, a Makita cordless drill. Everything else is done with hand tools. The additional wall and floor cabinets provide storage for tools and supplies.